There are many species of Eryngium Sea Holly used for both food and medicines, and several of them are hybrids for ornamental gardens. 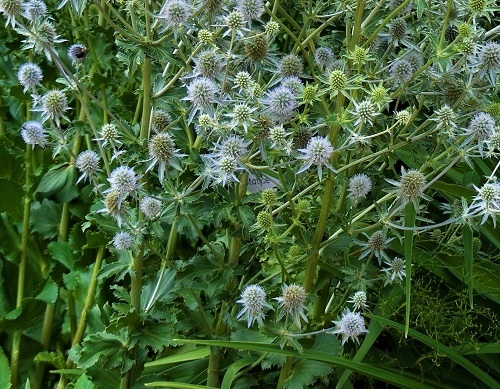 Sea Holly produce unusual and striking spiky blue blooms reminiscent of globe thistle from midsummer into fall. A center cone is packed with tiny flowers and is surrounded by a spiky collar, creating a dramatic bloom. Warm days with cool nights intensifies the blue flower color. Leathery foliage creates strong contrast. Deadheading spent blooms will encourage blooming. Sea Holly are low maintenance and with a deep taproot prefer not to be moved, over watered or over fertilized. The taproot makes division impractical and propagation is best by cuttings or seed collection. Some varieties not only look spiny and spiky, but are in fact sharp. Eryngium Sea Holly adapt easily to most soil conditions and are quite tolerant of drought and salt spray. That makes Sea Holly a desirable boulevard plant where heat and dry conditions prevail, but also where road salt is a problem. Sea Holly may have initial difficulties establishing where heavy snow cover creates wet and cold springs, but once established they should thrive. Good drainage is essential where winters tend to be cold and wet. Full sun and sandy soil that is dry but enriched with organic matter are ideal for Sea Holly. Not enough sun and too much water and fertilizer will cause tall varieties to sprawl and become leggy. Most species are hardy in zones 5 to 9, some are hardy to zone 4. Uniquely colored blooms and unusual textured Sea Holly are not only striking in the garden, but deserve space in your vase too. And they are easy to dry, cut the stems when the cones have turned fully blue. New introductions are constantly becoming available, in some cases one cultivar having different names. Confusion is quickly surrounding this plant, so to get the best plant for your needs try to purchase from a reputable nursery. Hardiness of each variety is still being tested by gardeners everywhere. Be cautious of claims, check with your local reputable nursery. Hardiness: Zones 4-9, some reports of hardiness to zone 3. Blue Sea Holly loves full sun and dry sandy soil. Be sure to give it some space when planting as it will not want to be moved due to a deep tap root. This will also allow good air circulation as Sea Holly prefers not to be wet. Dead head spent flowers to encourage blooming and extend the bloom period. Cut the foliage back in fall after the leaves have yellowed or leave the plant and final blooms to create seed heads for the birds and winter interest. Blue Sea Holly is tough and one of the easiest Sea Holly to grow. It has been reported to perform well even to zone 3 with proper conditions. Sea Holly are perfect for cut flowers and adds unusual interest and texture in the border or boulevard garden. Stunning when grown with other blues and silvers, and striking paired with oranges and yellows. Also known as ‘Amethyst eryngo’. Fertilize: Apply little or no fertilizer. Side dress with compost or fertilize lightly in fall. Known as Queen of the Alps, alpinum Sea Holly is native to Switzerland and tends to be the bluest of the Sea Holly. The color and blooming is spectacular in July and August and ages beautifully through summer, remaining fresh into autumn. The thistle like cone is tall and pronounced. ‘Blue Star’ may tolerate a bit of shade better than most Sea Holly, but bloom color will suffer. Blue flowers are most intense will all day sun, warm days and cool nights. Excellent as a cut flower, and is long lasting in a vase. The 2” vivid cones and slightly upward collar of fine feathery bracts are unique not only in the garden but also in a fresh or dried arrangement. Originally bred for cut and dried flower, ‘Blue Glitter’ will shine in your garden as well as in the vase. Tall sturdy stems hold glittery blue blooms. Profuse blooming all summer, from June into September. ‘Blue Glitter’ is an excellent variety for abundant blooms and easy to grow. Great for hot, dry beds, thriving on neglect and tolerates road salt in boulevard gardens. A single plant is perfect in a small garden or in groups for large areas. ‘Blue Glitter’ will grow easily from seed and matures quickly and may even bloom the first year. Star Holly all have deep tap roots so avoid moving once established. The plant will spread slowly and may self seed. Young seedlings are easily removed or can be moved before establishing. Removing spent blooms will prevent seeding, but birds love the seed heads if you leave them for winter. Also consider sister ‘White Glitter’. All the same great habits with a shining white bloom. Grow ‘White Glitter’ as a centerpiece on its own, or grow them together. 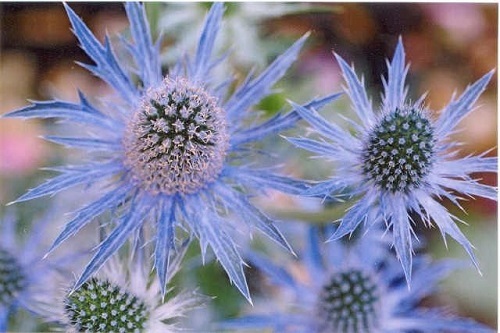 'Sapphire Blue' cultivar is set apart from the rest of the Sea Holly by its' heavy infusion of intensely steel blue through the stems, branches and into the leaves. The blooms are among the largest of the Sea Holly and are prickly. The plant is tall and well branched, adding substance to the Sea Holly drama. The blooms are abundant, beginning in June and continue through August and into September. Common Sapphire Blue Sea Holly Is a sterile cultivar so it will not seed. It is believed to be a cross between Eryngium bourgatii and Eryngium alpinum, but that has been difficult to verify. Flat Sea Holly is a small version of Eryngium with an erect but more full and bushy growth habit. ‘Blue Hobbit’ is a great bloomer all summer. The blue flowers are especially intense when grown in all day sun. And there will be plenty of blooms for cut or dried flowers. This long living bloomer is perfect for front of the border and small spaces. Don’t give ‘Blue Hobbit’ too much good soil, water or fertilizer or it will become lanky and sprawling. It will love neglected, hot dry beds and is tolerant of boulevard road salt. ‘Blue Hobbit’ will not tolerate being moved with it’s deep tap root, but may self seed a bit. Young seedlings can be moved before well established or remove spent blooms to prevent propagation. ‘Big Blue’ is a hybrid that was created purely by chance with open pollination by one unknown parent. It does not produce viable seed so deadheading to prevent proliferation in not necessary. This hybrid is a superior Sea Holly variety in so many ways. The blooms are exceptionally large with the collar brachts potentially reaching up to 4 inches across. Silvery cones and collars develop to iridescent intense blue to violet. Growth habit is a nicely formed clump.